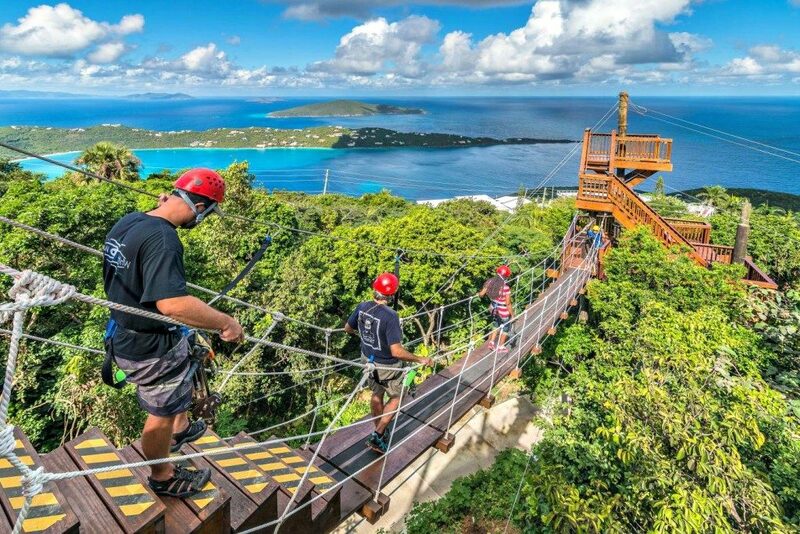 Being that we are in the thick of the summer season, we thought it would be appropriate to put together our Top 5 recommendations on What To Do in the Virgin Islands. 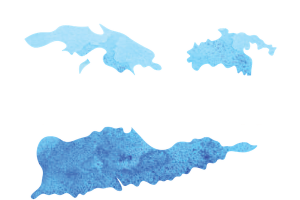 This week we will cover the Top 5 for St. Thomas…but don’t worry we will cover all of the USVI! Whether you are a visitor searching for “the best” of the islands, a lifer or a long time-local looking to switch up your routine, each of our suggestions are sure to bring you good times and unforgettable memories this season and beyond in the place of always summer. There is nothing quite like being out on the water. No matter what kind of trip you are looking for, there are plenty of options when it comes to finding the perfect charter. Want to party it up with a group of your best friends? There’s a trip for that. Looking to take a romantic cruise around the islands with your partner? There’s a trip for that as well. The typical charter lasts about a week, but sometimes they will allow you to do a weekend trip. You can get 2+ cabin cats, both sailing and motor, and most come with one bed per cabin. Remember, you will need to account for your trusty captain and their mate as they will also require at least one room. From always making sure your belly is full, to taking you to the most beautiful and unique stops to enjoy the views or the best snorkel sites, you are sure to become best friends with your hosts. So, after your week at sea, don’t forget to tip them to show your appreciation. They rely off of their tips heavily, so if they go the extra mile be sure to let your tip reflect that. Although there are MANY, some of our favorite stops in the VI right now are Virgin Gorda (try Coco Maya) and Jost Van Dyke (try Hendo’s Hideaway and the all-famous Soggy Dollar Bar). 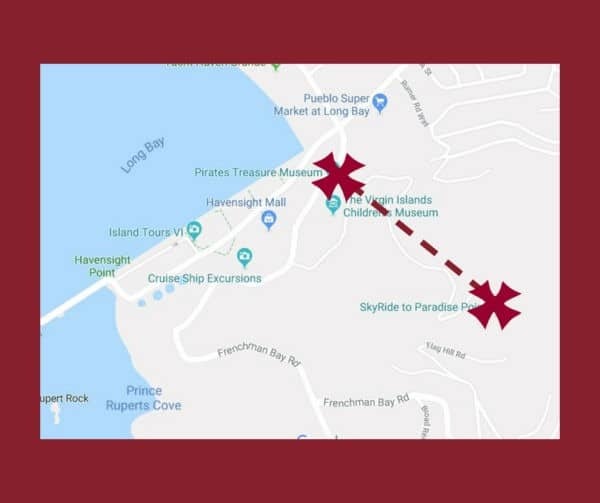 When you come back to the USVI try stopping in Coral Bay (Skinny Legs) or Cruz Bay (Lucky Chops), and in St. Thomas (the all time favorite post boat trip spot–Island Time Pizza). For more dining options on St. John click here and for St. Thomas restaurants click here. Enjoy the views from above at, literally, one of the longest attractions on the island–the Skyride at Paradise Point. The Austrian cable cars take you on a beautiful adventure 700 ft uphill leading you to an impressive restaurant and events space. The tram ride alone is an adventure well worth your time, but when you get to the top it is far from over. 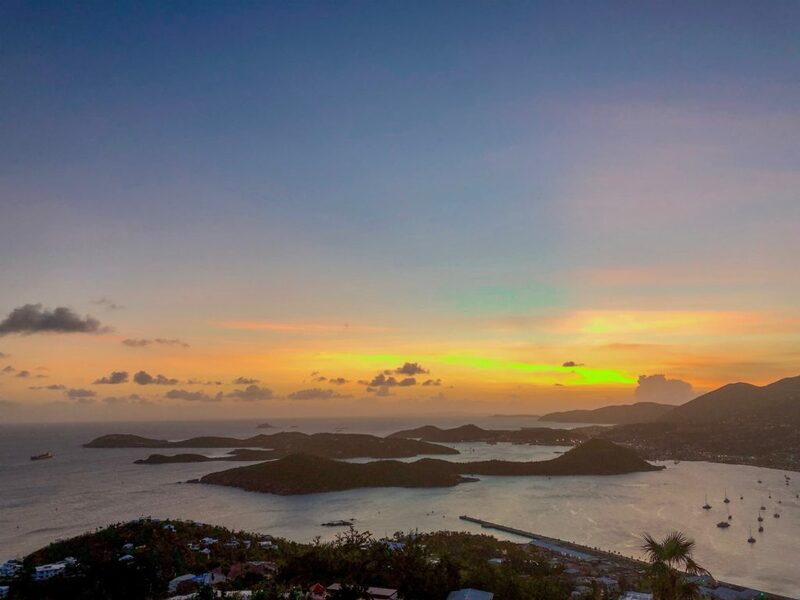 The views looking out from the restaurant are unparalleled and we would venture to say that this is the best Instagram worthy spot on island–perfect to make all of your friends jealous (I mean, happy for you) as you can see the entire harbor of St. Thomas (just see the picture above). Here you can imbibe on their signature Bushwacker drink while enjoying the view and listening to the steel pan. If you are around on Wednesdays it is local night and it is always a good time– we highly recommend! If you insist on going against the grain of “island time” and have the need for speed, check out Treelimin’ Adventure. Treelimin’ is open (as is everything on this list) post-hurricane and is another major attraction on island. The course boasts 6 zip lines situated at the top of the St. Peter Mountain and there you get to experience the lush rain forest and watch the azul waters glisten as you ride through the forest. We always get asked for our recommendations on what to do in the Virgin Islands (hence our name) and we find ourselves talking about this one quite often. This course is safe, and fun, for all ages (5 and over, if under 5 tandem zip is available), so you can bring the whole family! Average time needed to complete the course is 2-2.5 hours. 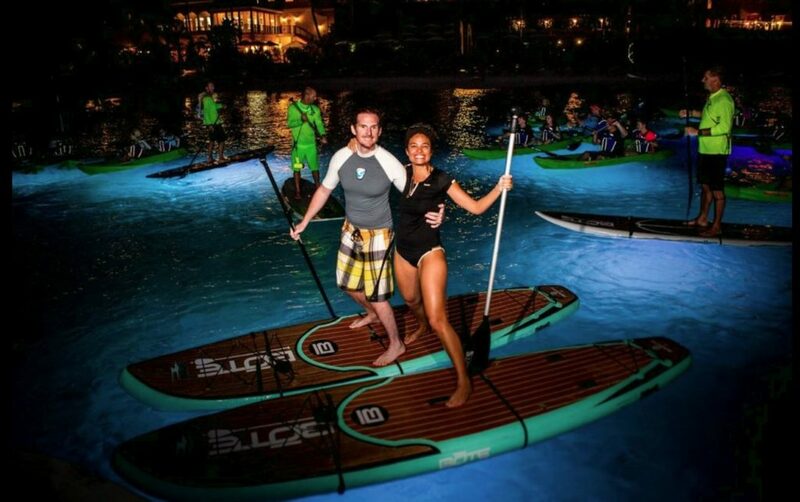 One of the more unique things you can do with your friends, family or for a date night, is kayaking (or paddle boarding) at night with Night Kayak near the Marriott Frenchman’s Cove. The tour will take you around a picturesque cove and through an abundance of beautifully colored fishes and marine-life in their patented kayaks and paddle boards. These boards are special because they have see-through bottoms and LED lights that are strapped to the bottom of them so that the entire ocean floor and it’s contents are lit up with a beautiful mesmerizing glow. During your trip, you will be led by informative and friendly guides who will tell you all about the sea life you are seeing, as well as some local pirate history. This is one of the only places in the WORLD you can experience something like this. If you don’t want to take our word for it just yet, just check out their TripAdvisor and read the raving reviews here. 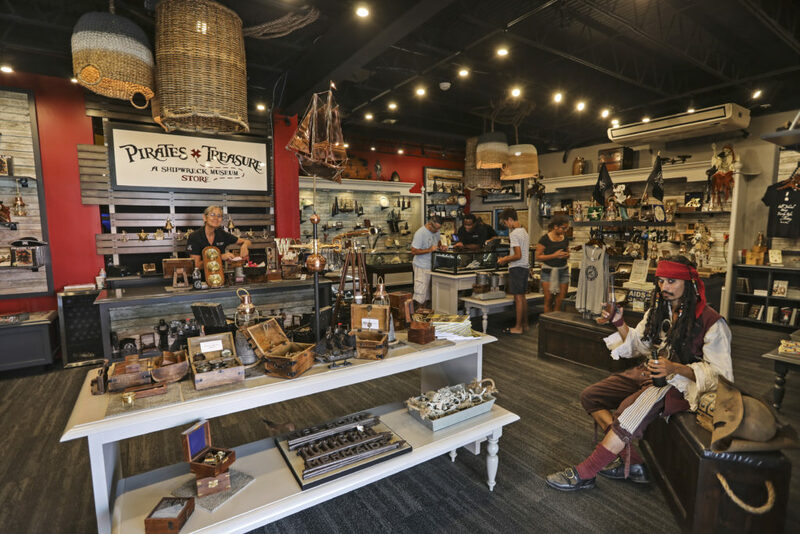 One of the newest and largest attractions on island is The Pirates Treasure Museum. What is this “pirates treasure museum” you may ask. Well, it’s not ALL about pirates. Although there is a literal pirate by the name of “Captain John” (pictured above) who will engage with you and tell you many stories and exciting pirate lore (many say he is Johnny Depp’s twin…we agree). At the museum there is a plethora of information about St. Thomas and Virgin Islands history, rare and authentic artifacts from shipwrecks from all over the world, and a world-class gift shop that looks like something you would see at Disney World (and yes there is something for all ages in it!). You will be engaged with some of the most friendly and informative staff you have met (seriously, read the reviews) who will give you a thorough education throughout the entire experience. With 7,200 square feet and two floors, trust us, there is A LOT to explore and discover. The museum is open every cruise ship day and now you can even purchase your tickets or their best selling products directly on their website, they are definitely worth checking out: www.pirate.vi. Also note, the museum is actually located at the bottom of the hill to the tram ride, so you can easily knock out two activities in one trip! Tickets to enter the museum are $16 ($10 for locals) and $12 for kids–a great deal, especially for the experience. The tram is $20 (also a deal!) so you can have one fun-filled evening for an unbeatable price. That wraps up our Top 5. We hope you are able to hit all of our St. Thomas recommendations on What to Do in the Virgin Islands and we look to covering more on all of the islands. Don’t forget to send this to your friends and share your comments and questions below!